Here's a big virtual hug for you right now. I'm crazy like that! I'm Lana. A book-lovin' (and BOOT-lovin') Southern gal. I crave adventure & have had many these past couple of years: Living In Italy; My Husband's Deployment to Afghanistan; Homeschooling; Starting the Process to Foster; Decorating & Tablescaping & Cooking (Especially in my MAMMOTH Crockpot! ); Music (In "another life," I was a professional singer/songwriter & public speaker! ); Theatre Productions & LIFE, AMAZINGLY CHAOTIC LIFE. I'm a writer & musician by profession, but, really, I'm just a LIFE LOVER. And I thank GOD for the gift of this life. I'm humbled by organization & time (no concept of them whatsoever) but I try my hardest. It's part of my daily adventure. My only real goal with this little blog is TO ENCOURAGE YOU to live your adventure, too. To try new things. To soak up every facet of this amazing life. To share with you HONESTLY when life is NOT easy. To never give up. And to never stop loving & being grateful amidst all of the above. Here's ANOTHER big hug for you! Yes, I'm definitely crazy like that! I'd be honored if you would like to grab my button. 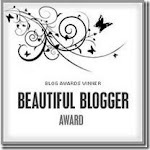 My First Blog Award from Brown Eyed Belle!! !